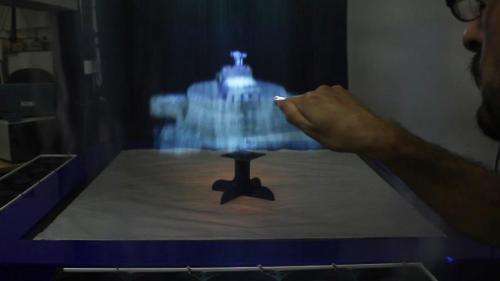 A tabletop display with personal screens made from a curtain of mist that allow users to move images around and push through the fog-screens and onto the display, will be unveiled at an international conference later this month. The research paper, to be presented at one of the world's most important conferences on human-computer interfaces - ACM CHI 2014 [26 April-1 May], could change the way people interact and collaborate in the future. MisTable, led by Professor Sriram Subramanian and Dr Diego Martinez Plasencia from the University of Bristol's Department of Computer Science, is a tabletop system that combines a conventional interactive table with personal screens, built using fog, between the user and the tabletop surface. 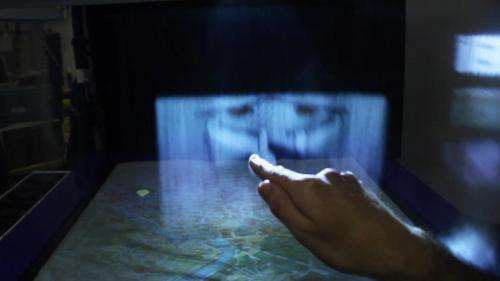 The personal screen allows a range of customisations and novel interactions such as presenting 2D personal content on the screen, 3D content above the tabletop or supplementing and renewing actual objects differently for each user. Sriram Subramanian, Professor of Human-Computer Interaction, in the University's Bristol Interaction and Graphics group, said: "MisTable broadens the potential of conventional tables in many novel and unique ways. The personal screen provides direct line of sight and access to the different interaction spaces. Users can be aware of each other's actions and can easily switch between interacting with the personal screen to the tabletop surface or the interaction section. This allows users to break in or out of shared tasks and switch between "individual" and "group" work. "Users can also move content freely between these interaction spaces. Moving content between the tabletop and the personal screen allow users to share it with others or to get exclusive ownership over it. The research team believe MisTable could support new forms of interaction and collaboration in the future." More information: MisTable: Reach-through Personal Screens for Tabletops, Diego Martinez Plasencia, Edward Joyce, Sriram Subramanian, Proceedings of ACM CHI 2014 Conference on Human Factors in Computing Systems, Toronto, Canada, 26 April-1 May 2014. Meh. I built something similar to this years ago. The novelty wears off fast when you realize how useless it actually is. Plus the condensing vapor tends to make a huge mess. Every little step is good. I think I would still prefer some sort of surrogate for my hand/fingertip. Aside from getting my hand wet, having some sort of adaptable pointer just seems like a more flexible way to interact. There are also more possibilities for haptic feedback if my hand were controlling a pointer remotely. It could be partially transparent to avoid obscuring content. A pointer could trivially take any number of forms - pincers, paddles, etc. depending on the needs of some content being displayed. Not so easy with the evolved feet we humans are stuck with. I agree. I would also suggest that your pointer include the standard two buttons and wheel that you have on a mouse. That would allow you to click on things in the air unambiguously. When using a device like the kinect on xbox, the system relies on pure gesture control, but that often seems cumbersome. Pausing for a full second or two in one place, with your hand in a certain pose does not feel smooth or natural. Hey, you could infuse those vapors with caffine and this system would sell a lot better. :) (or for us smokers, it could use e-cigarette vapors, and the system would sell even better!) Then not only could you sell the hardware and software, but also make a killing on the vapor refill packs. That was a joke, btw.